My motivation (if I can put it that way in the first place) comes from the recent fatal accident of the Lamborghini on the BRT (Bus Rapid Transport) corridor near South Delhi. 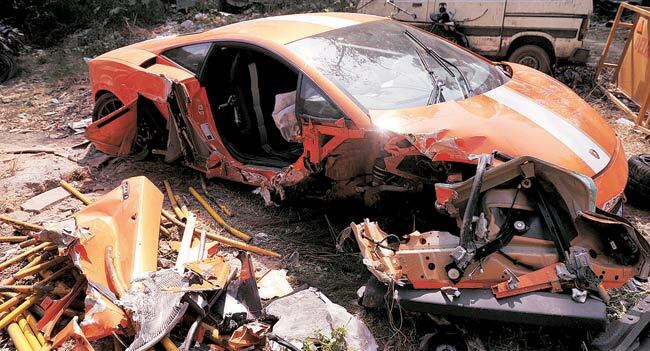 Supercar accidents, off-late have become almost a common sight. The roads in our country remain narrow (in most of the places), the traffic remains quite a bit chaotic and diverse and there is a serious lack of empty, fast stretches of road. Yet, the craze for these fast machines are at an all-time high what with spottings of these beauties becoming all the more common with each passing day. If my memory serves me right, last year we saw another crash which involved an expensive Porsche. That time it happened at the India Gate roundabout but fortunately had no fatalties, as the occupant was wearing the car seat-belt. Both this and the Lamborghini accidents, I believe had one thing in common – the machines were being driven at extremely high speeds; the Porsche at an scintillating 180km/hr. and the Lambo at an unbelievable 200km/hr.! The problem, I believe is not with the wealth that people own (as a result of which they get to buy such machines in the first place) but with these high-performance supercar themselves, especially when driven on our ‘roads’. Beauties like a Ferrari, Bugatti, Maserati, Lamborghini or Bentley are absolute engineering marvels, but how well they are driven/ made to perform on Indian roads is anyone’s guess, quite frankly speaking. The top speed of these machines are way over 300km/hr. and what instantly comes to mind as you hear this unimaginable top-speed figure is how difficult these cars must be to control. No, they are not difficult to handle; infact they are absolute handling marvels IF you know how to handle them, but when given our uncertain roads and traffic, it becomes really terrible. As a matter of fact, manufacturers like BMW, Mercedes, etc. put a cap on the top speeds of their vehicles at 250km/hr., perhaps, recognizing the fact that their owners might not really be able to handle anything more than 250km/hr.! But, nonetheless, this does not guarantee a safer driving experience/ behaviour by the drivers. Another major issue with these cars is the devastatingly fast acceleration that these machines are capable of. For example, a Lamborghini can accelerate past the 100km/hr. in under 3.5 seconds flat. And if you continue with the ‘pedal to the metal’ philosophy, it can hit the 200km/hr. mark in under 10 seconds. Now, THAT is extremely fast, any-way you look at it. We are not really trained to handle such machines, let alone the steep acceleration and everything else that comes with such a fast vehicle. I understand that this brutal acceleration is what gets these cars ‘going’ in the first place and makes them a hoot to drive, but as responsible road users, we MUST keep things under control at all times. Clearly driving such marvels isn’t everyone’s cup of tea. If only there were barriers other than price to ensure these cars went to those who deserve it, else its only like a monkey holding a loaded pistol. Yes thats a absolute correct words and i give the same answer to most of my friend .. owning such great cars and bikes is not a big issue with people who has good $ in there hand but we lack the roads and traffic situations in our country which also put trouble for Indian vehicles like even a 150cc bike or a 800cc car .